In association with Ol Pejeta Conservancy (OPC), Laikipia, Kenya, this project constitutes a longitudinal study of the taphonomic and ecomorphic characterizations of bone communities in the conservancy’s mosaic of several well-defined habitat types. Project co-directors Dr. Briana Pobiner (Smithsonian Institution) and Dr. Kris "Fire" Kovarovic (Durham University, UK) are tracing changes in mammal habitat affiliations and predator-prey pressure across time and space - information that will be used to interpret past ecologies and mammal community dynamics in the Plio-Pleistocene fossil record. The project began in 2007, building on pilot study data collected in 2003 and 2005. OPC has agreed to host the project from 2008-2012. 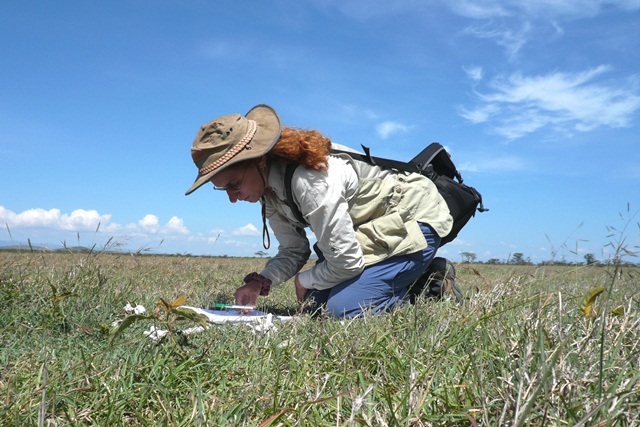 Collaborators include Professor Peter Andrews (Natural History Museum, London – vegetation and habitat associations), Nathan Gichohi (OPC – ecological monitoring, kill site identification), Dr. Geff Wahungu (Moi University, Kenya – ecological monitoring, vegetation mapping) and Dr. Nick Walton (Legendware, York – GIS, data storage). Check out an online educational seminar by Dr. Pobiner about this project and what modern bones can tell us about biodiversity. Briana Pobiner examining zebra carcass. Kovarovic, K., Pobiner, B.L., 2008. 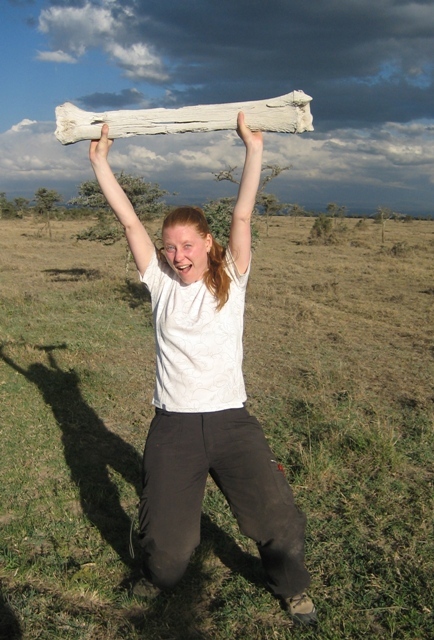 Bones of Ol Pejeta: neotaphonomic and ecological survey. Poster presented at the Society for American Archaeology, Vancouver, BC, Canada. Behrensemyer, A.K., Pobiner, B.L., 2004. Differing impact of carnivores on bone assemblages in two East African ecosystems. Paper presented at the Society for American Archaeology, Montreal, Canada. Pobiner, B.L., Kovarovic, K. 2011. The bones of Ol Pejeta: clues to the past. Popular Archaeology Volume 4, September 8 2011. Bones contain evidence of how early humans lived, died, and interacted with other organisms. Explore what kinds of important clues scientists can find on bones.